Here's a fresh, new entry! Minsan lang to haha. I am just so excited to share with all of you how fruitful and amazing my Sunday last week was. Spent that day learning about history, reliving the past, admiring world class architecture, re-igniting our love for the country and imagining how Manila once was. How? Well, when Carlos Celdran announced on Facebook that he'll be doing an Escolta & Old Manila tour on a weekend, I knew I just had to be there. I've always been a huge fan of Carlos. I joined his Intramuros and Imelda tour before and they were such a huge hit. His storytelling skills' just phenomenal. Perfect din 'coz I had no ASAP that day (Mother ZsaZsa is leaving for New York to shoot their new teleserye) and my pulmonologist cleared me to leave the house again. I convinced my cousins, Nico, sis & bro-in-law to come too, so I had our slots reserved. Here are stories through photos! Meet-up place was at El Hogar, a 102-year old beaux-arts style building, a majestic piece of architecture found at the corner of Calle Juan Luna & Muelle dela Industria facing Pasig River. It survived World War II and several earthquakes. Sadly, in this modern world, it might not survive from greedy businessmen or people who wants to tear it down. The tour was organized to raise awareness on the true state of our national treasures and heritage sites. It is a wake up call and a shout out to the government, to end the neglect and save places such as this. Places that were part of our history, and a part of who we are now as a country and a nation. As Carlos said during the tour, to make the invisible city visible. Built in 1914 by the Zobel Family as a wedding gift and former offices of Ayala Life Insurance. Guide map! It was also a "Pay As You Can" tour. We paid P300 each. Can you see that building where Philtrust Bank is? 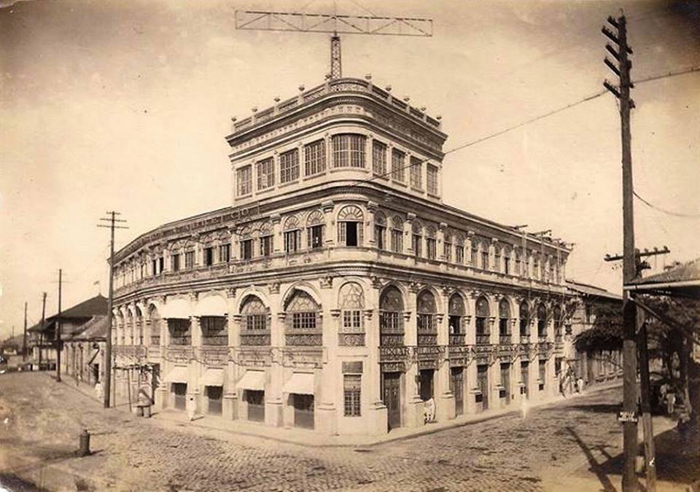 That is the Art Nouveau Mariano Uy Chaco Building, now the Philtrust Building, designed by Samuel E. Rowell in 1914. Plaza Moraga. Pre-war. With view of Uy Cha Co Buiding. Now owned by Philtrust Bank. WOOOW. 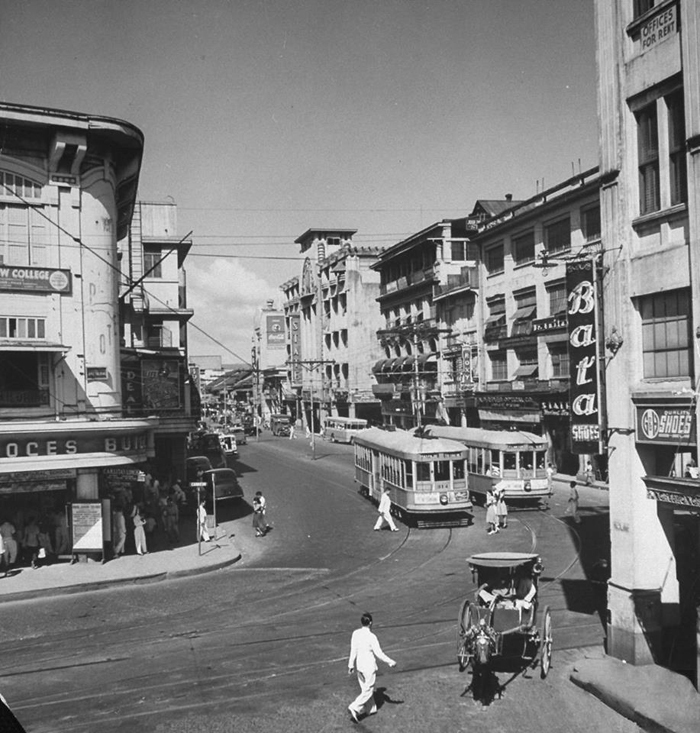 View of Escolta towards the east. Spanish Colonial times. Note: No electric wires. And streets made of cobblestone! Ganda. Shempre hinahabol namin lagi si Carlos. Hehe. Carlos gathered all of us in front of Polland. 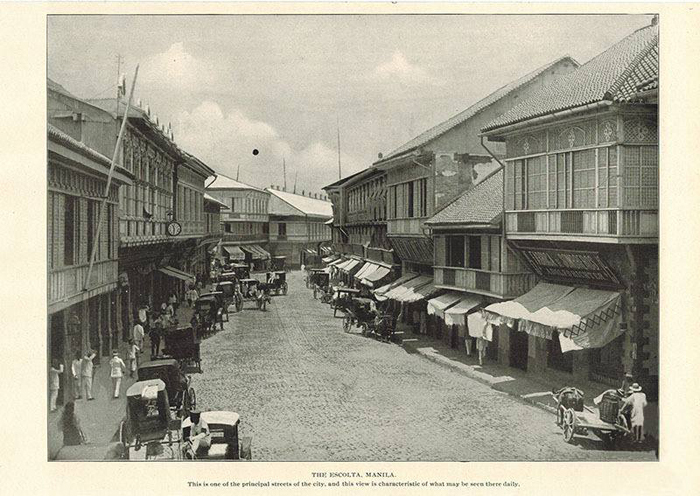 He gave us some background about Escolta and what's it like living here a century ago. He gave us a few minutes to roam around on our own, avail of the free hopia (and buy too! ), and interact with fellow tour-ists. P.S. My sister and I are obsessed with their lumpia! And now, with their hopia. Hehe. So good! Quick selfie with THE Carlos Celdran! Ayan o inavail ang free hopia. Haha! Yum!!! Melts in your mouth. Hopia na food? Or hopia sa love? That is the question. 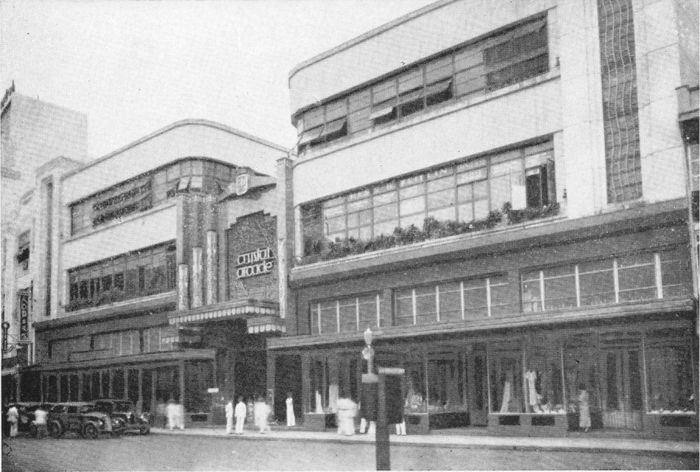 Capitol Theater is an art deco building built in the 1930s, and designed with a double balcony by National Artist Juan Nakpil. During that time, architectures such as these were considered rare and difficult. Capitol Theater on the left! The Crystal Arcade. Designed by National Artist for Architecture Andres Luna de San Pedro, son of National Artist for Painting Juan Luna. It was considered the most posh building on the whole street. 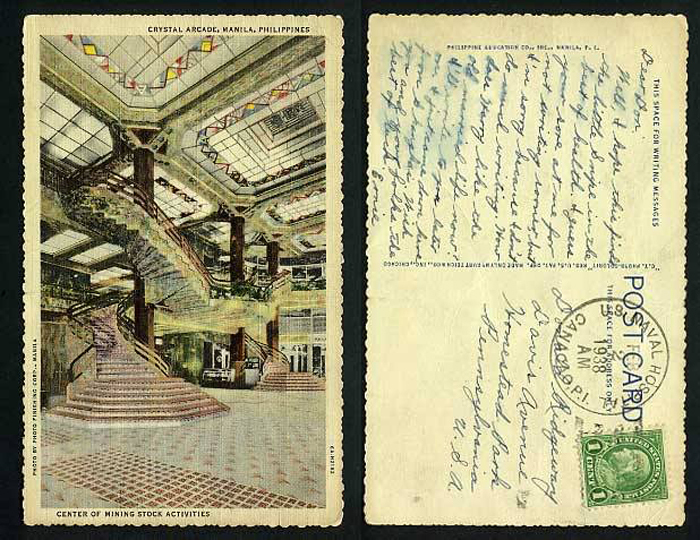 Postcard of the Crystal Arcade. Floors were made of Carrera marble from Italy; ceilings of stained glass; the entire edifice was air-conditioned, and it was the home of the Philippine Stock Exchange. Calvo Building & Masonic Headquarters now. 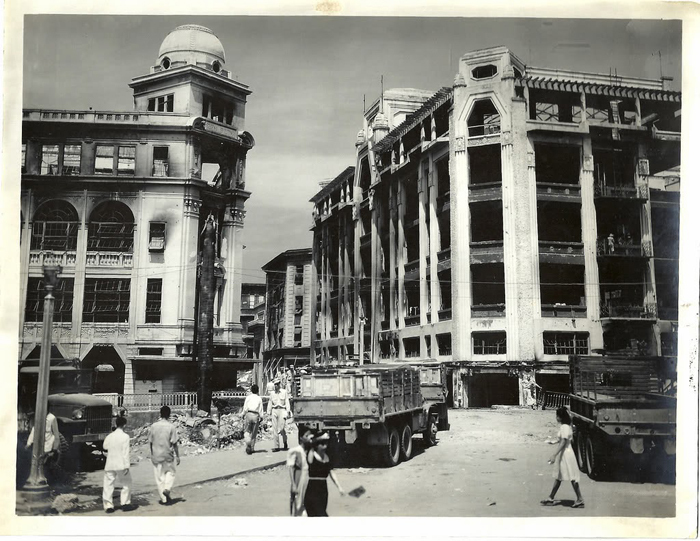 View of Calvo Building and the Masonic Headquarters post-WW2. View of Jones Bridge and cascos. Detail of Jones Bridge. Designed by National Artist for Architecture Juan Arellano. The Philippine National Bank and Masonic Headquarters. Pre-WW2. View from across the Pasig River. 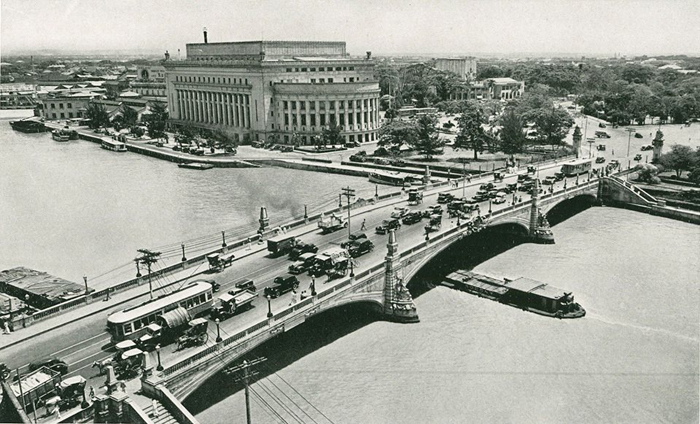 View of the Pasig River, The Manila Post Office, and Jones Bridge from the rooftop of the Juan Luna Building (Citibank). The Natividad, located along Escolta corner Calle Tomas Pinpin, is one of the most beautiful buildings along Escolta! It's amazing how it survived the war and seems to continually age gracefully. I cant believe that this building is more than a hundred years old!!! Just like Calvo Building, it is famous for its beaux-arts style architecture which originated from France. It was designed by Filipino-Spanish architect Fernando de la Cantera Blondeau. 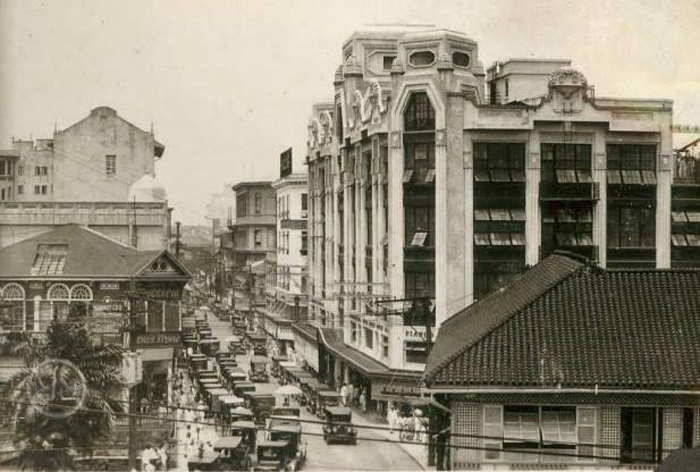 Natividad was known or called the Philippine Education Company Building or the Hamilton Building during the pre-war years. 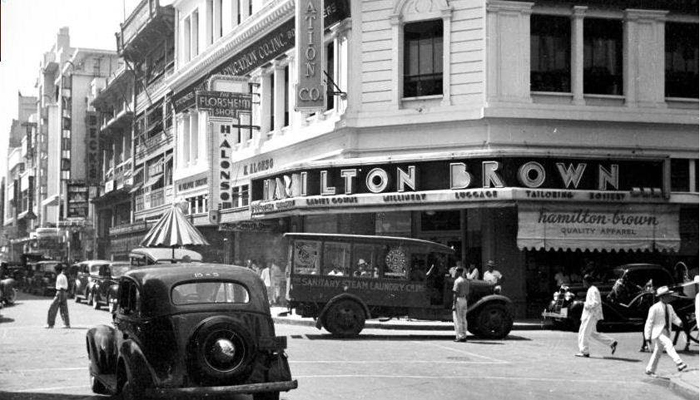 Two popular stores occupied the lower floor-- Hamilton Brown (department store-ish) & H. Alonso Boutique (which carries the famous Florsheim Shoes). The Philippine Education Company Inc. or PECO occupied the upper floor. It's a pre-war bookstore. I hope they make this into a boutique hostel or a quaint cafe! 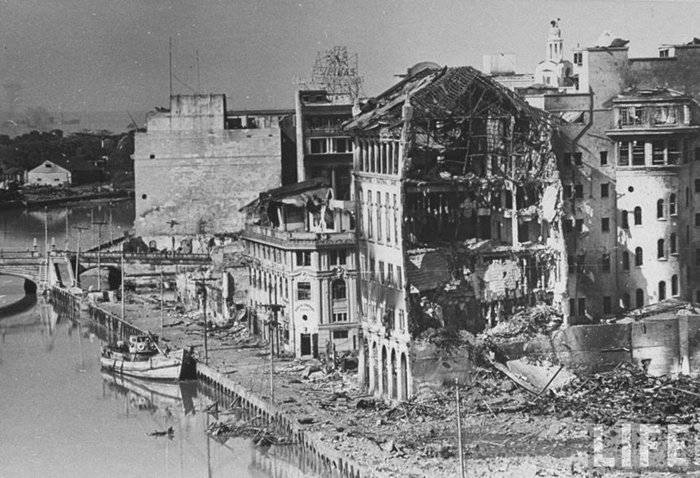 The Regina Building (left), and the Pérez-Samanillo Building (right) partially damaged during the Liberation of Manila in 1945. Escolta Facing west. 1950's. 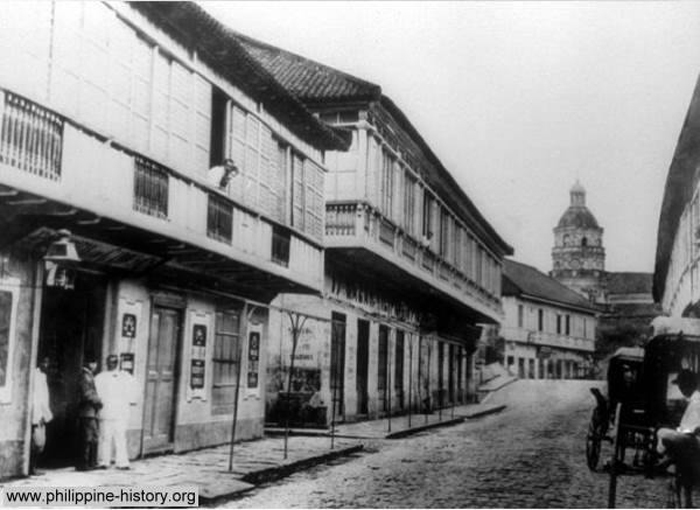 Perez-Samanillo Building to the left (Today known as the First United Building). 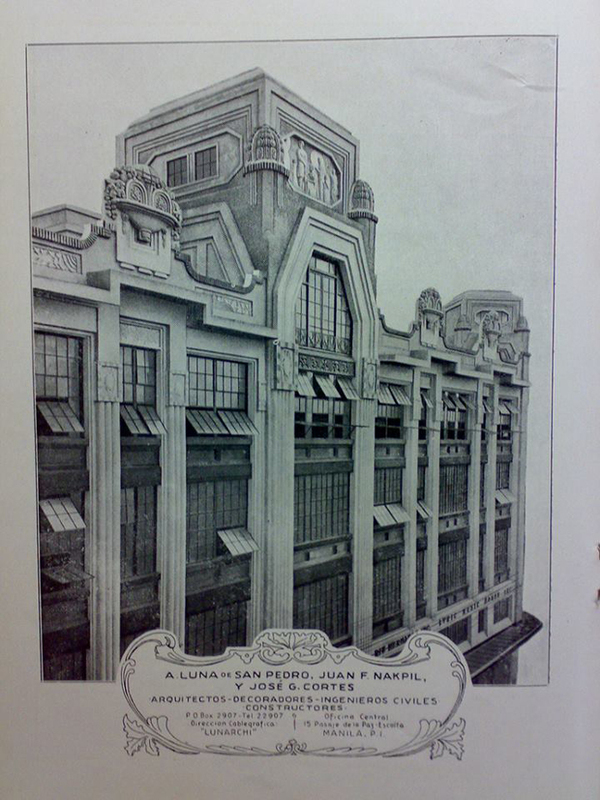 A detail of the Perez-Samanillo Building, today known as the First United Building. Designed by Andres Luna de San Pedro. Juan Nakpil and Jose Cortes as collaborators. 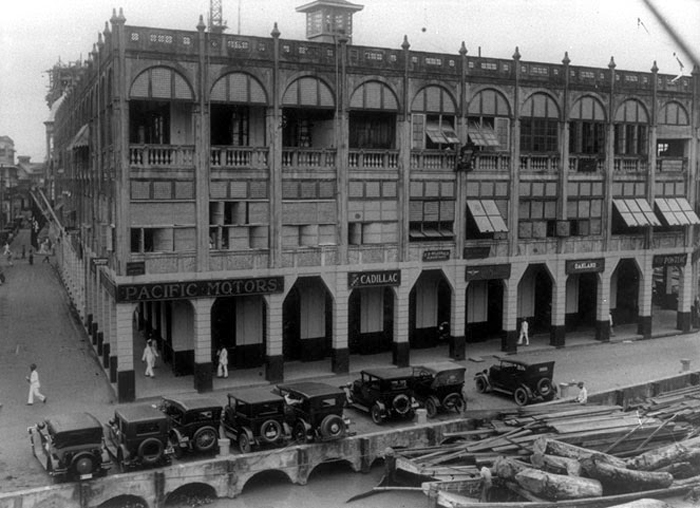 The Perez-Samanillo Building (First United Building). Pre-WW2. Circa late 1920s; early 1930s. 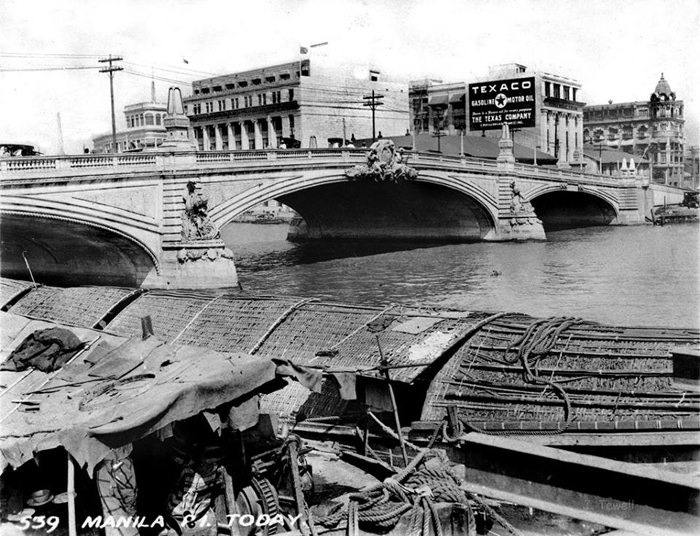 Escolta facing west post WW2. Regina Building to the left. First United Building to the right. Now, let's go inside First United Building! The area where the art exhibit is held was the old Bergs Department Store! 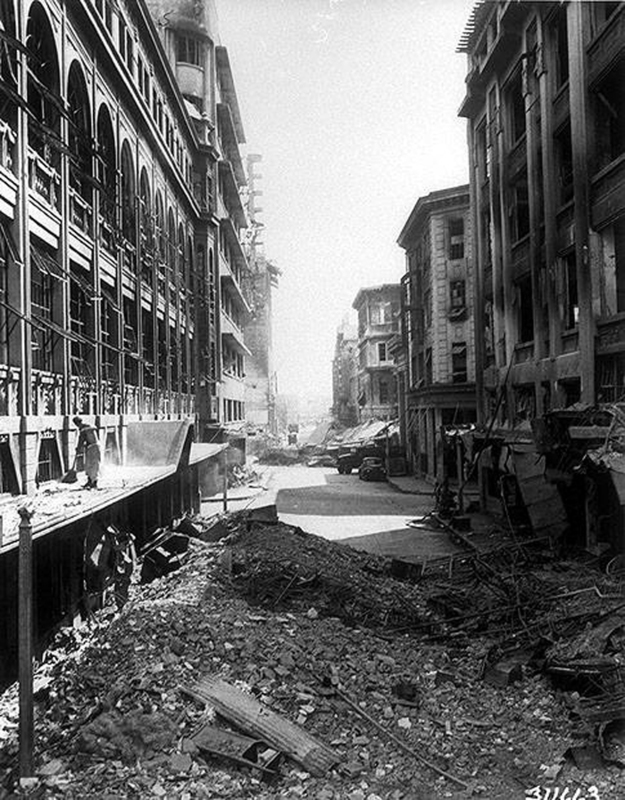 Photo was taken in 1941. SO COOL. Took a photo of the staircase from below when Kuya in red decided to take a peek see. Ang tanong-- tao ba sha or mumu? Haha. Free water, juice & hopia!!! Just had to take a photo of this beautiful stranger. Love her outfit and her vibe! So 50s, so Pan-Am! Enjoying the free hopia. Haha. Sarap! Escolta St. Regina on left, First United on the right. 2016. Same street and angle. Before World War II. 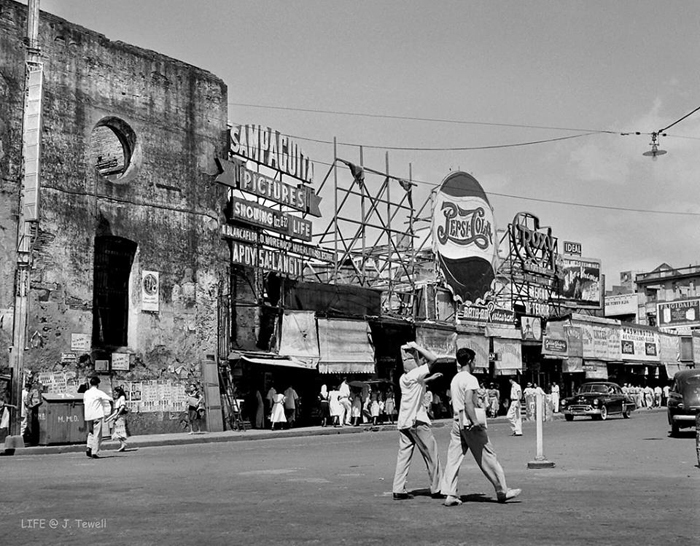 Here are some more old photos of Escolta! This is just WOW. No automobiles yet. And look at their clothes. 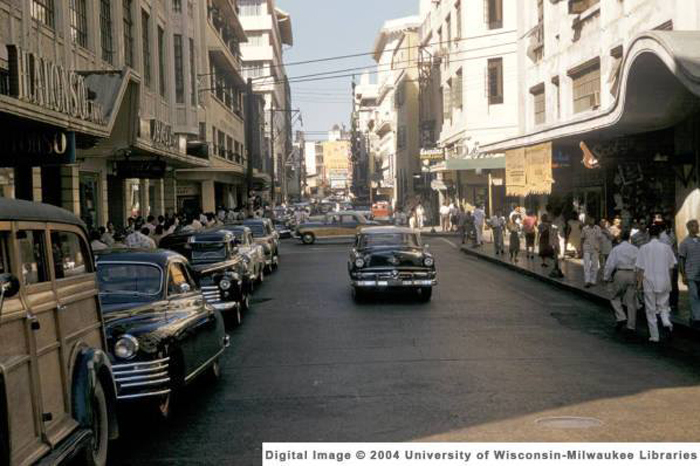 This was taken early American era, that's why there are electric wires na. .
View of Escolta towards the East. Now you could see more electric wires, trams, an ice cream parlor (Clarke's) & a few English words! 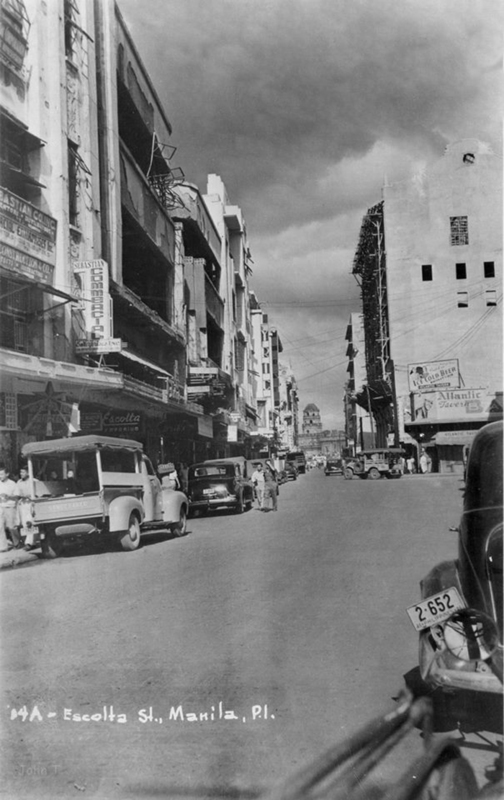 Escolta Street facing west. Pre-WW2. Heacock's Department Store to the right. Burke Building on the right. 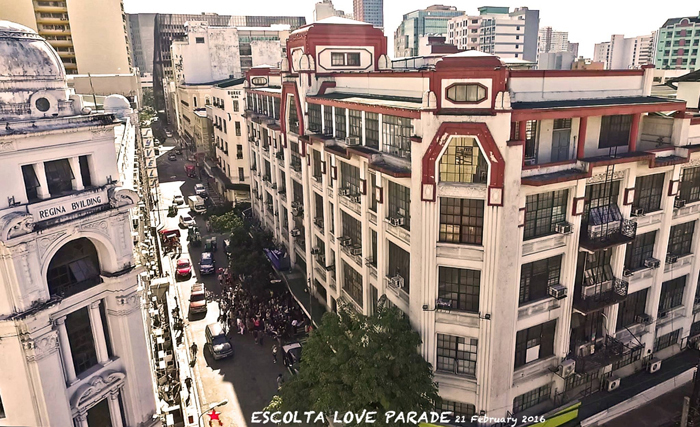 Escolta facing East. 1890s. Santa Cruz Church belltower in the distance. Plaza Goiti turning into Avenida Rizal. Pre-WW2. Note the trams (tranvias). Today, the LRT trains cover all of Rizal Avenue. 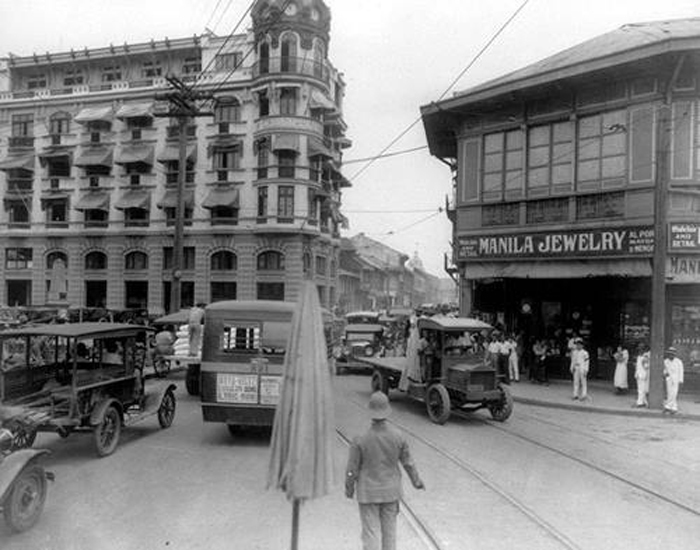 View of Escolta to the East. Post-WW2. Most buildings damaged and a jeepney in the far end of the picture. Can you see the SYVEL sign? 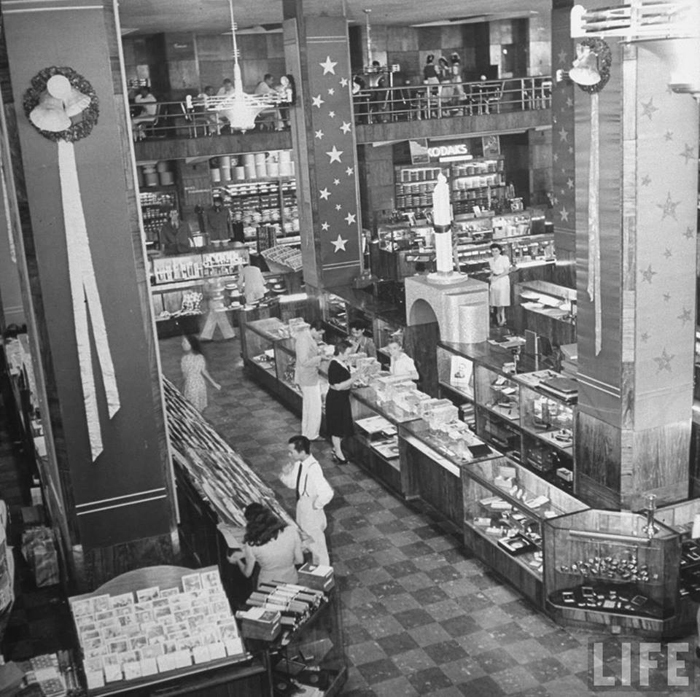 It's a popular, high-end department store during the pre-war time. The sign is still there until now. 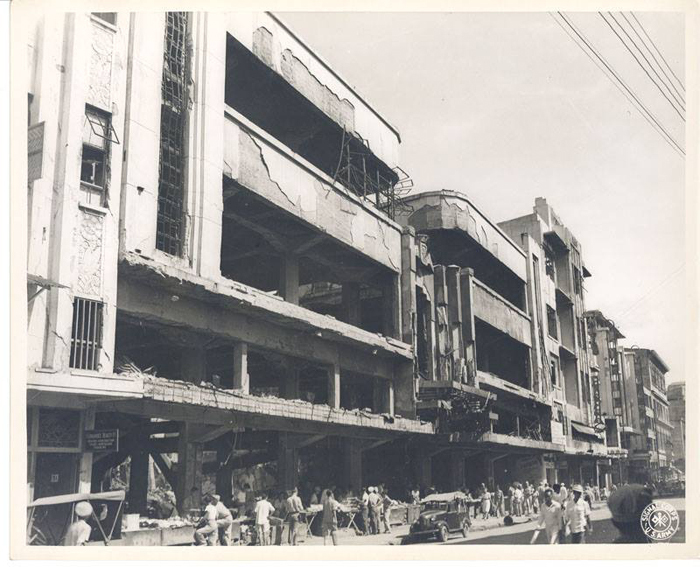 That building is also known as the Gonzalo Puyat building built by National Artist for architecture, Leandro Locsin in late 1960’s. Ito sha dati o! Wooow. Circa 1890s. 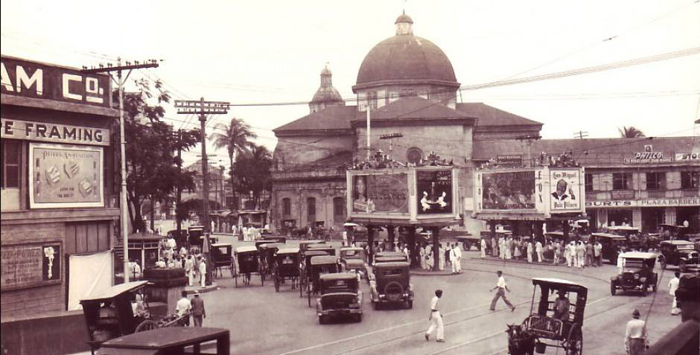 History: Pre-war, Plaza Goiti was considered the heart of Manila. 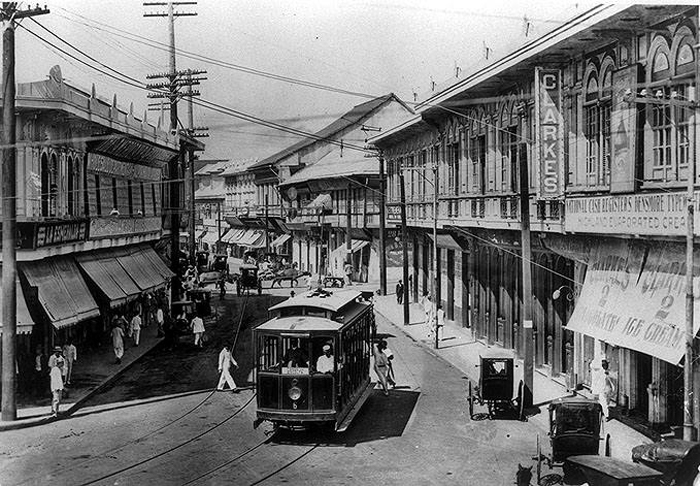 During the American colonial period, the commercial activity in Manila happened here because of the many infrastructures made and the launch of the Manila tram system with its central terminal located at the plaza. 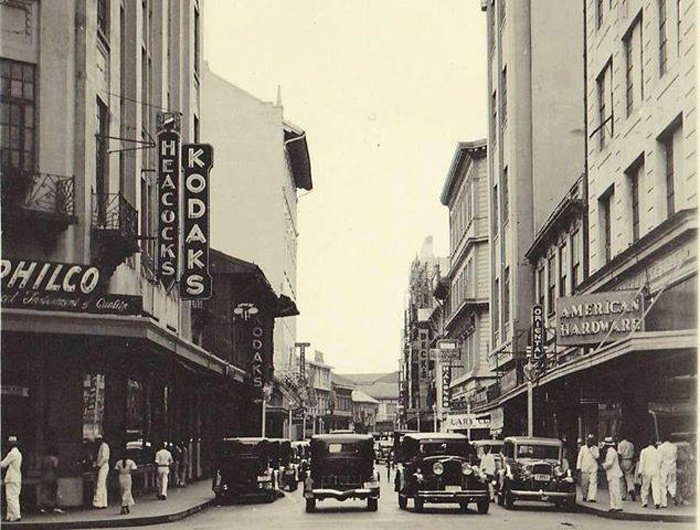 There were lots of commercial establishments and shops which serviced American servicemen. 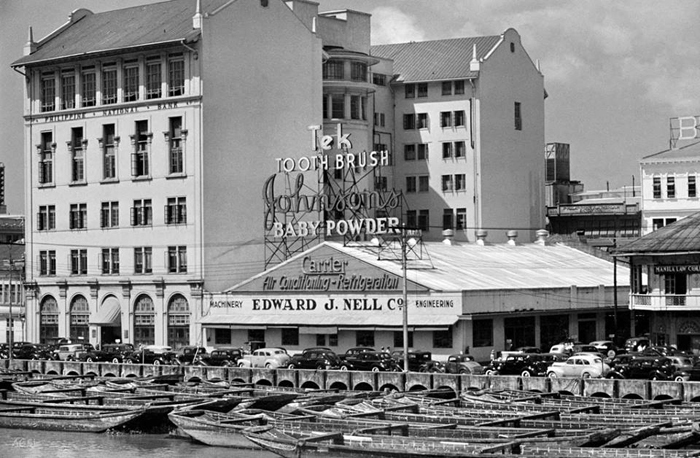 After the war, the plaza remained as the business center but the area had a hard time picking up the pieces so they transferred businesses to Makati. 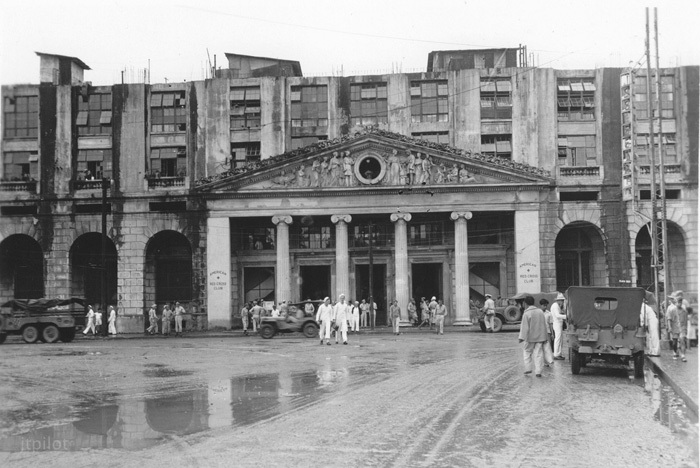 Plaza Goiti (Plaza Lacson) post-WW2. Note: Gutted Santa Cruz Church. 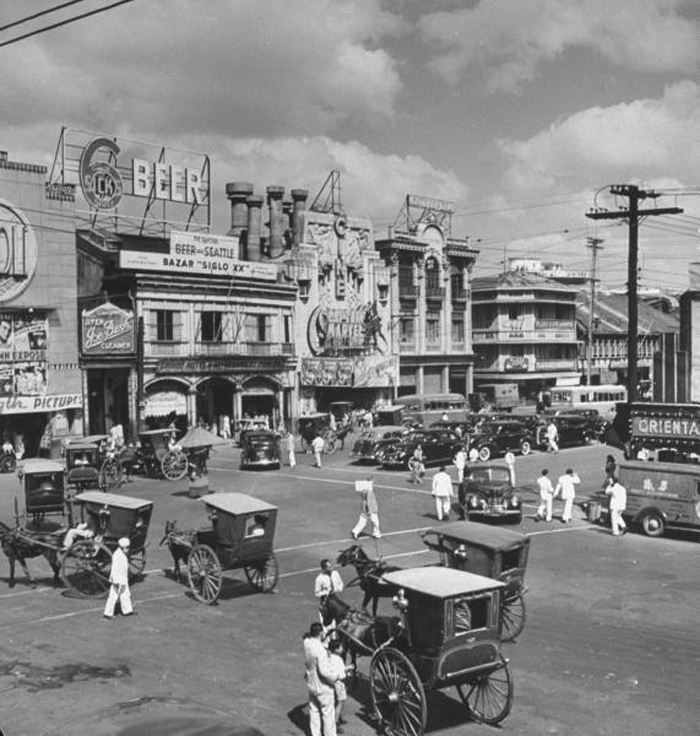 Plaza Goiti (now Plaza Lacson) pre-WW2. Circa 1920s. Note: Two tranvia stops right in the middle of the plaza. 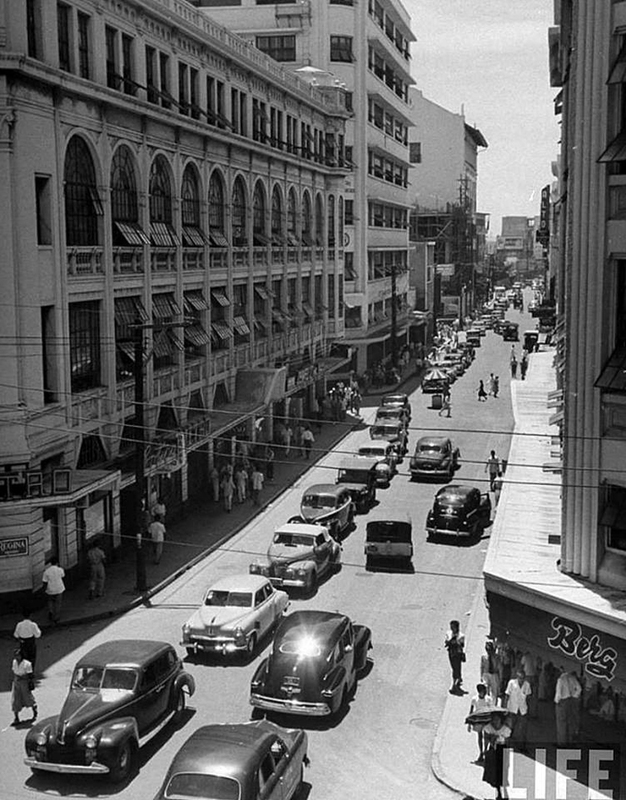 Plaza Goiti in the 1950's. No more tram station. 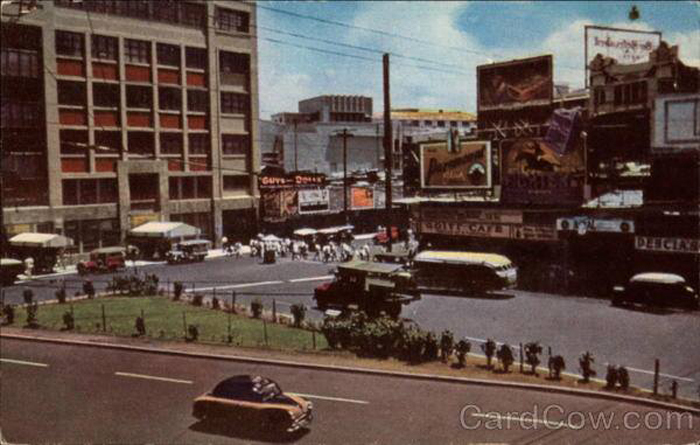 Jeepneys now present in the far left of the photo. Santa Cruz Church is a Baroque church located in Plaza Santa Cruz. It was built by the Jesuits in the early 17th century made of stones and wood. The church got destroyed by an earthquake in 1863, but Fr. Agustin de Mendoza reconstructed it in 1868. It's last repair and reconstruction was in the 1950s. Today, the church architecture employs a California Spanish Mission façade silhouette with the usual Filipino (Asian-Hispanic) baroque ornamentation. The church facade is topped with an effigy statue of Our Lady of the Pillar, the patroness of the church whose feast happens during the second week of October. 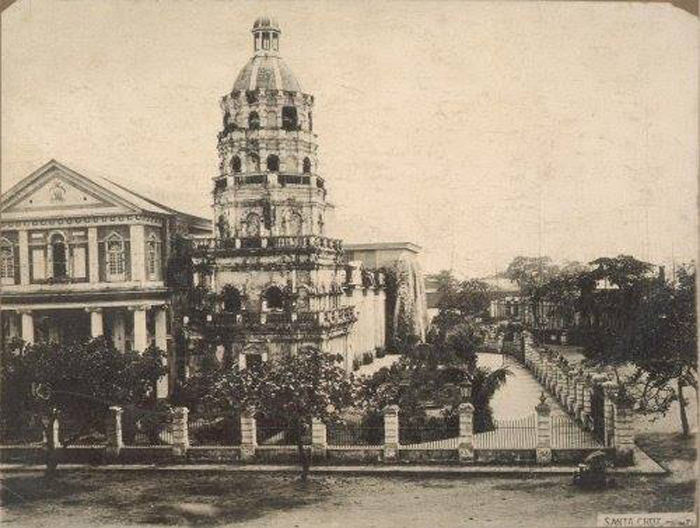 Santa Cruz church in the 19th century. Carriedo Fountain (Spanish: Fuente Carriedo) was built in honor of the 18th-century Capitán General of Manila, Don Francisco Carriedo y Peredo, benefactor of Manila's pipe water system. 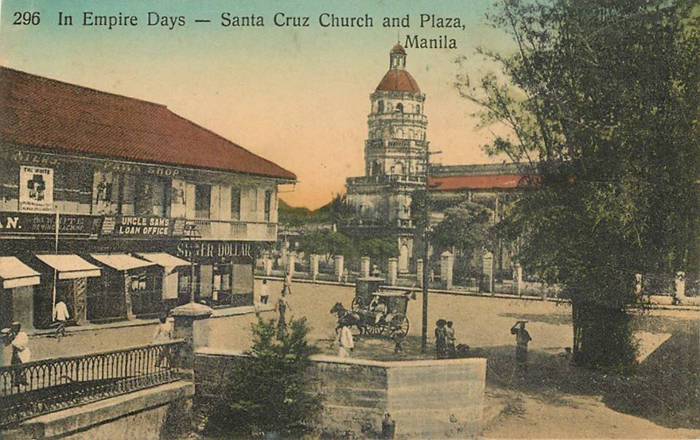 It was moved three times before its current location at Plaza Santa Cruz, right in front of the Santa Cruz Church. 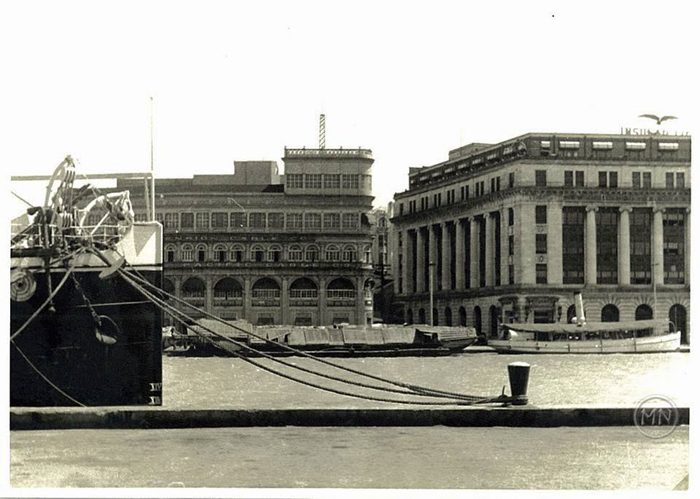 It was built in 1882 as part of the Carriedo water works system, more famously known as Manila Waters or MWSS! 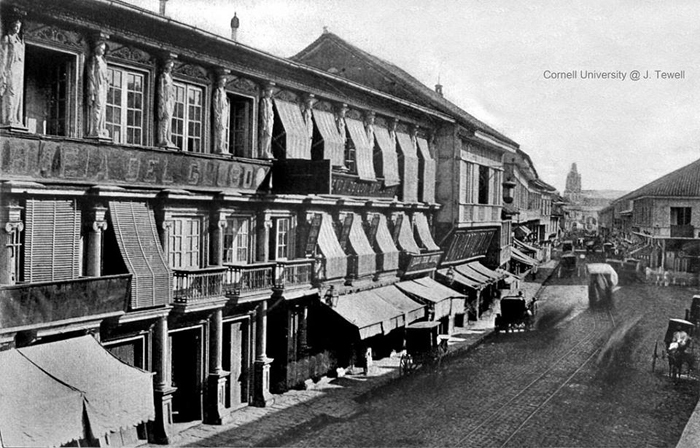 Monte de Piedad is considered the Philippines' first savings bank. 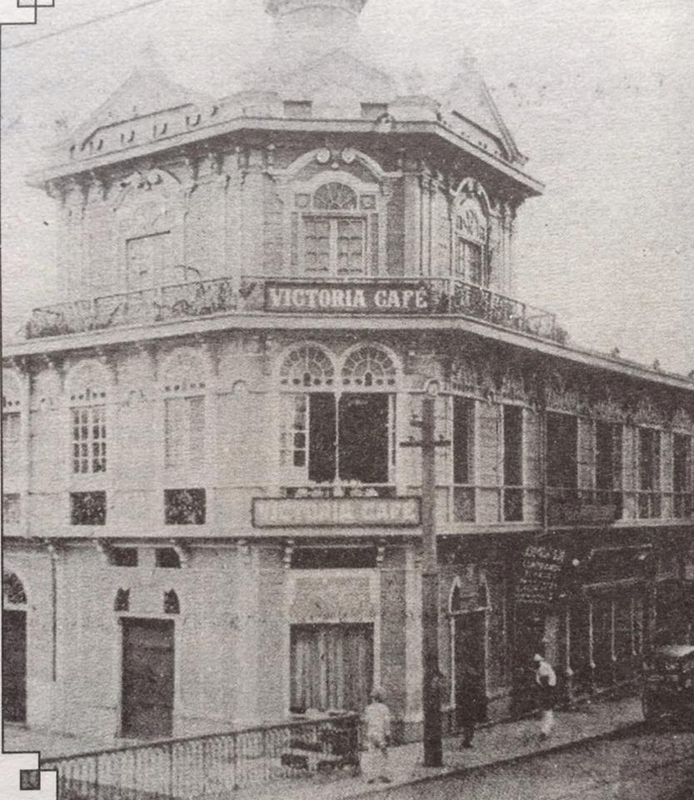 Its original name in Spanish was Monte de Piedad y Caja de Ahorros, and had its first building on Plaza Goiti in Santa Cruz, Manila. 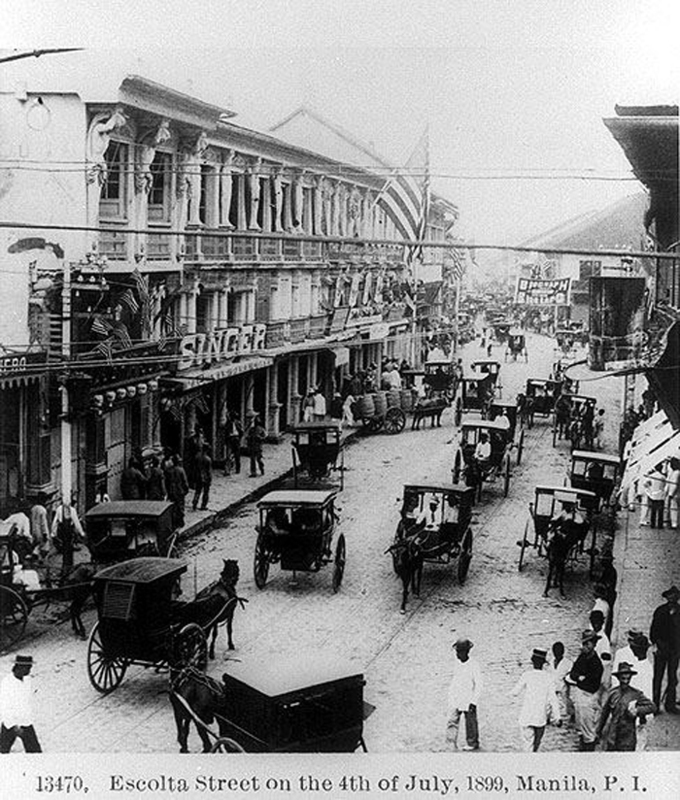 The bank was instituted by Governor General Murillo and the Archbishop of Manila in 1882. Plaza Santa Cruz. Pre-WW2. Monte de Piedad Building is third from the right (Extant). Today, Carriedo fountain is located at the center of this plaza. This is where our tour ended!!! Learned so much in the almost 2 hours of walking around Old Manila and Escolta. :) We all parted ways here. While most of the people who joined the tour immediately returned to El Hogar, our group decided to walk around some more and explore Binondo! Ongpin is famous for its many Chinese herbal stores, restaurants, jewelry shops, bakeries and groceries. When I turned 11, my Mom gave me a pretty gold ring which we bought from Ongpin! Ayun sinangla ko sha when I was in HS during my rebelde and emo days. Haha. In fairness, tumaas yung value! Haha. My cousin and sister shopping. Yayamanin. Hahaha. So much to choose from! They're pretty cheap too! There were so many good restaurants along Ongpin, but we've got Estero na on our minds. Next time we go back, will definitely try them all! :) I saw so many Chinese drugstores along the way. Passed by the original LIDO resto! Next time ka sakin! I know na this area! If you go straight sa Ongpin North Bridge, you'd see Ramada Hotel & Binondo Church. 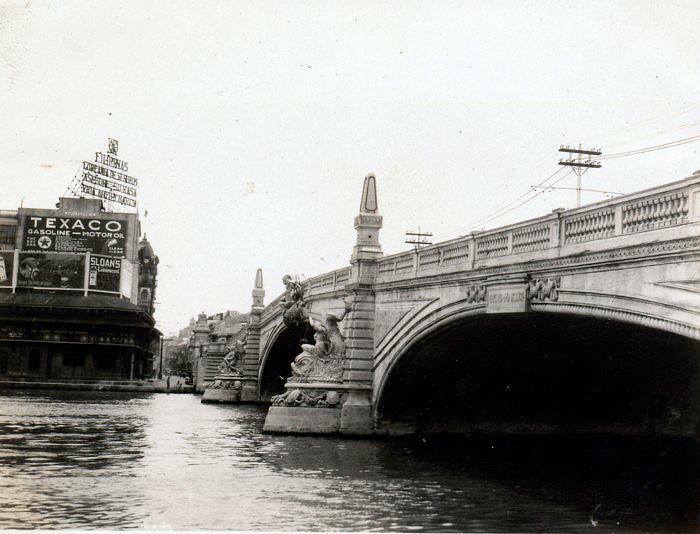 Facing Ongpin North Bridge, immediately turn left and you'd see ESTERO! This place was recommended by my Tito. Also saw this (post tour) sa MMFF movie na All You Need Is Pag-Ibig! Cool. It's called ESTERO because obviously it's located beside an estero-- Spanish for creek. Haha. They offer Chinese & Filipino dishes. :) If you're feeling adventurous, order the fried frog legs! For sharing! We paid P200 each ata. I forgot. Haha. We ordered fried squid and spare ribs. Also yang chow. Drop by Eng Bee Tin and don't forget to try out and buy their famous tikoy & hopia! They also offer other chinese delicacies. Perfect for pasalubongs. Tried out their ube pastillas hopia and it's so good!!! Across Eng Bee Tin is Blesed Lorenzo Ruiz Crusader's Academy! it's for everyone to see! Verdict: Would definitely go back here! Legit their dumplings. Super tasty and it's not soggy. It's also super affordable for P180 per order. Each order is 16 pcs. :) I also loved the fried pancake! Matches the dumplings perfectly. Right mix of salty (dumplings) and sweet (pancakes). Perfect pantanggal umay. Careful lang of the sticky colorless syrup inside the pancake. It may look like water but it's super duper sticky. had a hard time removing it sa phone ko. And sa clothes ko. Haha. From Dong Bei and Yuchengco street, we walked nalang going back to El Hogar where our car was parked! We just crossed the street (still along Yuchengco) and walked 'til we reached the end of the road (Pasig River and Jones Bridge). Touring around Manila and this area is actually very easy because it's just all in a circle. Sabi nga rin ni Carlos and based on our own experience. Also helps a lot if you have Waze! How to go to Escolta or Binondo? You can go here by bringing a car or by commuting. If you're commuting, just ride the LRT and get off at Carriedo station. From Carriedo station, malapit nalang the BPI Escolta building. ;) You could also ride the LRT Purple line and get off at Recto station. From Recto, ride a jeep ging to Sta. Cruz and tell the drive to drop you off at Escolta. Voila! Easy breezy db? 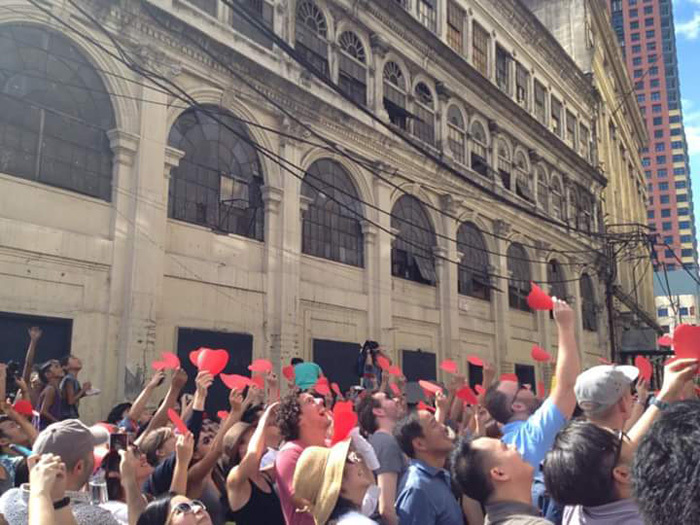 Carlos Celdran has another Love Parade: Escolta Tour on March 6 and on April 9. Join na! If you want to save these buildings, our heritage and history, take part and let your voices be heard. No task is too small, no goal unattainable, if in the end it gets us to save pieces of our history. Pieces that anchors all of us to our past, a past that made us who we are today-- a strong and free nation. :) Viva Manila!!! These look interesting and I also want to go there. Lovely article! Thank you for this. It is my dream to revamp these buildings some day with our development company. However, for now, the projects are out of our reach. But some day!